After last week’s visit to Canterbury, I am continuing my travel around the country during the month of August, visiting some of the places my father photographed, and for this week I have travelled to the other side of the country to Newport in South Wales to visit the wonderful Newport Transporter Bridge. Looking at it today and back in 1947 when my father visited during National Service in the army when he was based a short distance away in Chepstow. 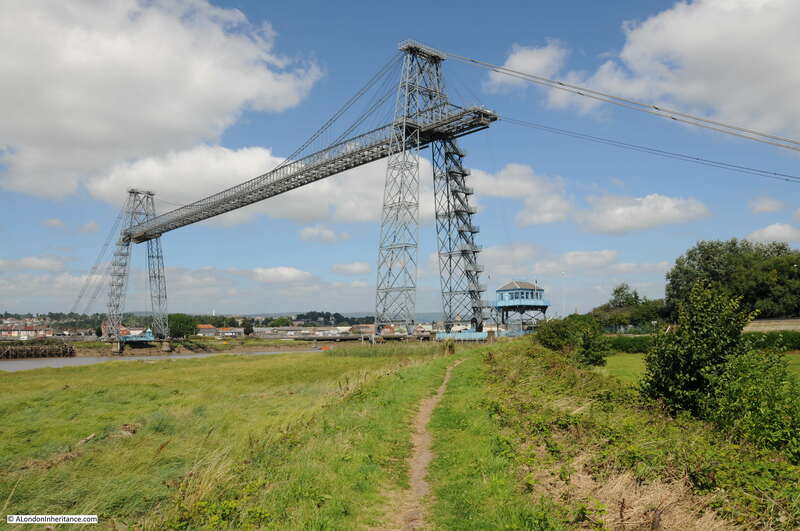 The Newport Transporter Bridge is a fully working bridge that uses a gondola to carry people and vehicles over the River Usk whilst providing a very high bridge clearance to allow shipping to continue to pass underneath, something that would not have been possible with a traditional bridge design. 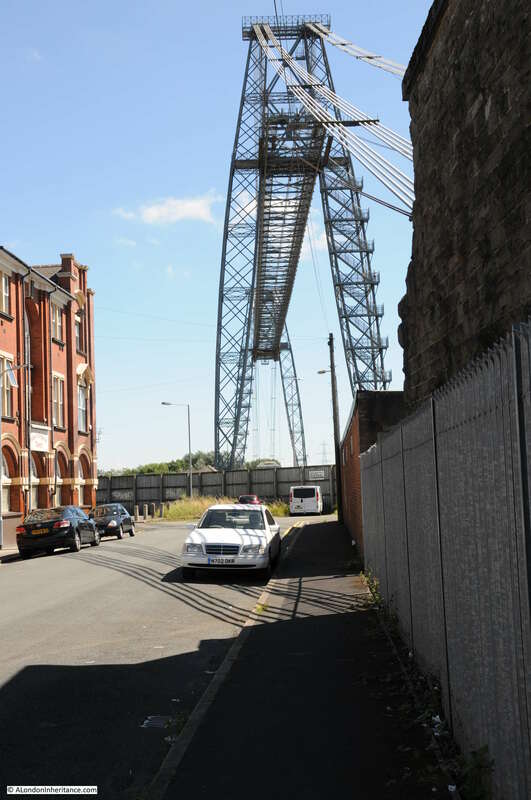 So what does a transporter bridge look like? The following photos are my father’s from 1947 and my 2016 photo showing the transporter bridge from the east side of the River Usk. In both photos, the gondola is docked at the left side of the bridge, I will show this in more detail later. 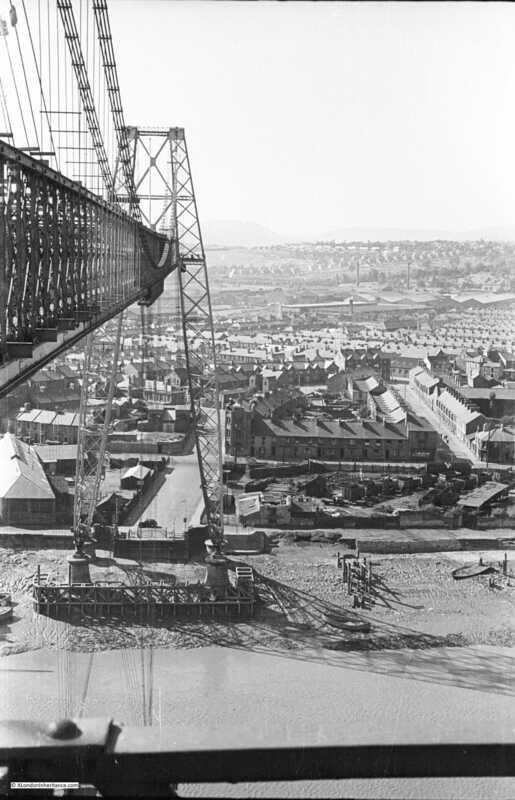 The Newport Transporter Bridge was opened in 1906 to provide access from the city to a new steelworks being built on the east side of the Usk and to avoid the existing congested crossing of the Usk further upstream. 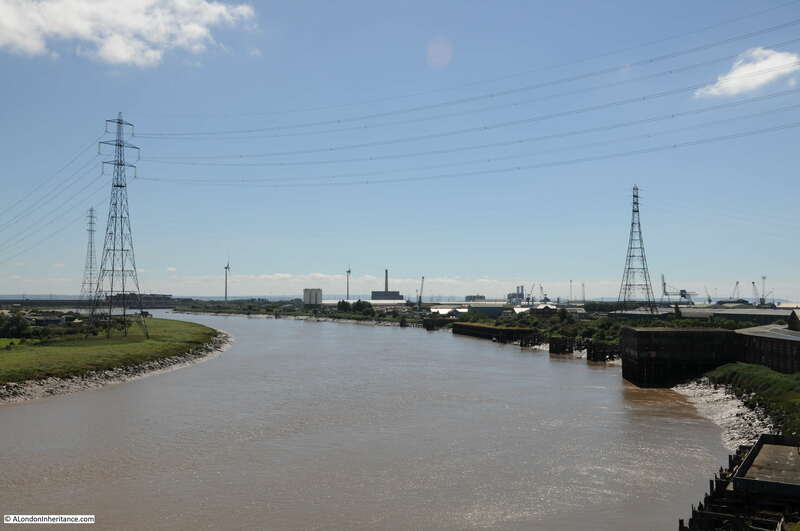 The challenge with providing a crossing was the need to provide sufficient clearance for shipping with the very large tidal range of the Usk. Newport was a very industrial city during the 19th and first part of the 20th century with many industries related to steel, shipping and with a large docks so there was a large amount of shipping needing to move up the river past the proposed location of the bridge. 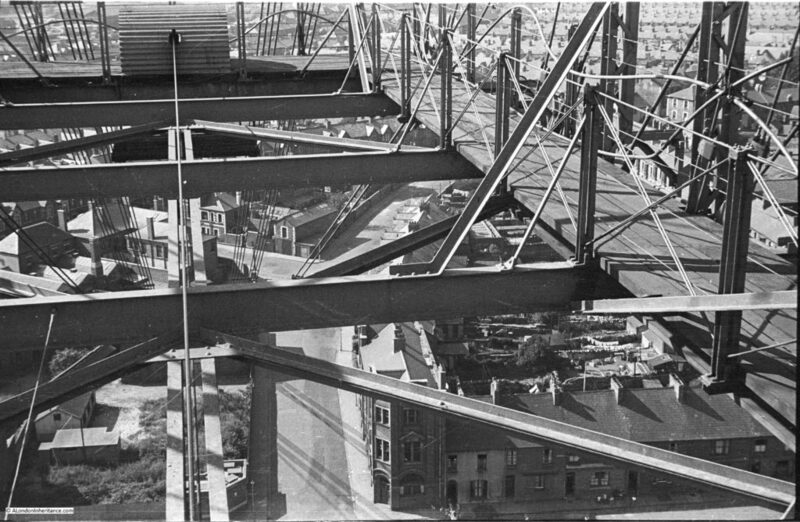 In the next photo, we can see the western side of the transporter bridge in 1947 taken in Brunel Street which ran straight up to the bridge. The West of England Tavern is the building on the left and the bus is a number 9 to the docks. 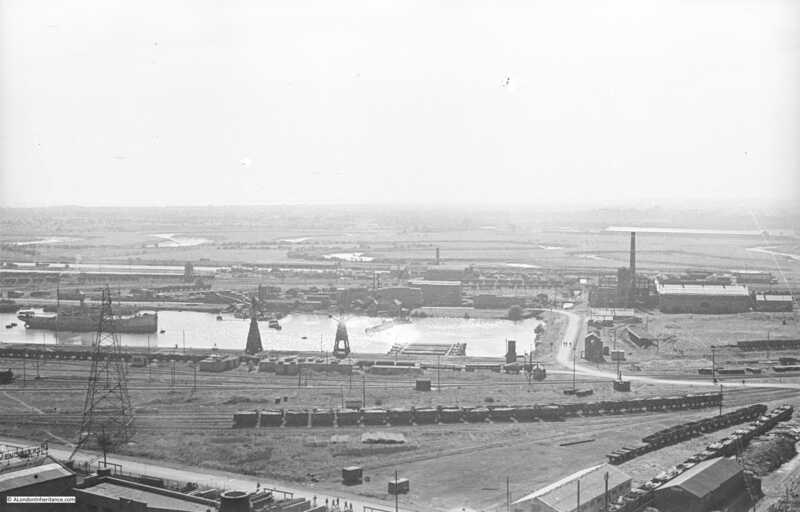 The same view today. 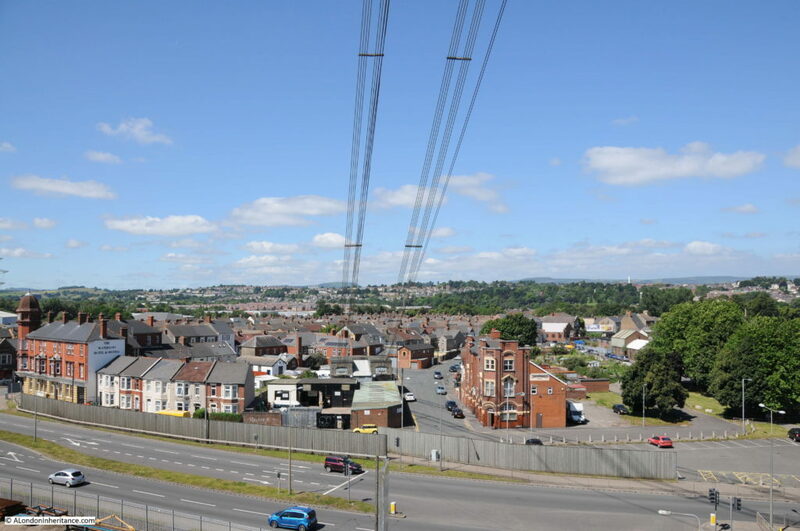 Brunel Street has been separated from the bridge by the new A48 ring road around the southern end of Newport. The pub is still there, however no more buses to the docks. 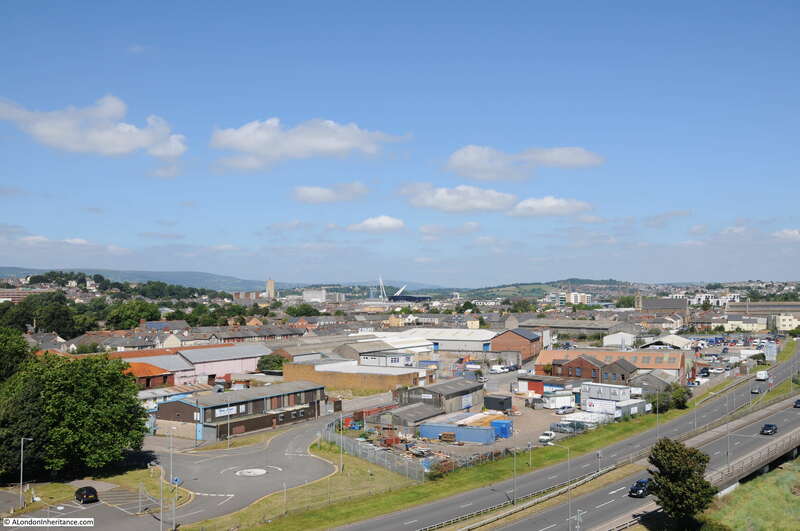 A view further back from the junction of Brunel Street and Alexandra Road. 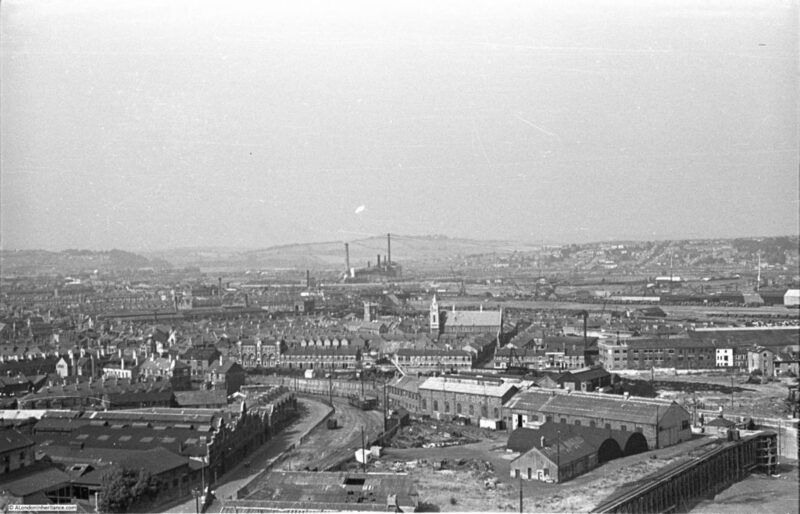 The houses on the left are still there. I did try and take a photo from the same spot, however there is now a large tree in the gap between the houses which totally obscures the view of the bridge. The majority of the design of the Newport Transporter Bridge was by the Frenchman Ferdinand Amodin who was a specialist in the design of suspension bridges and who had already worked on a transporter bridge near Bilbao in Spain. 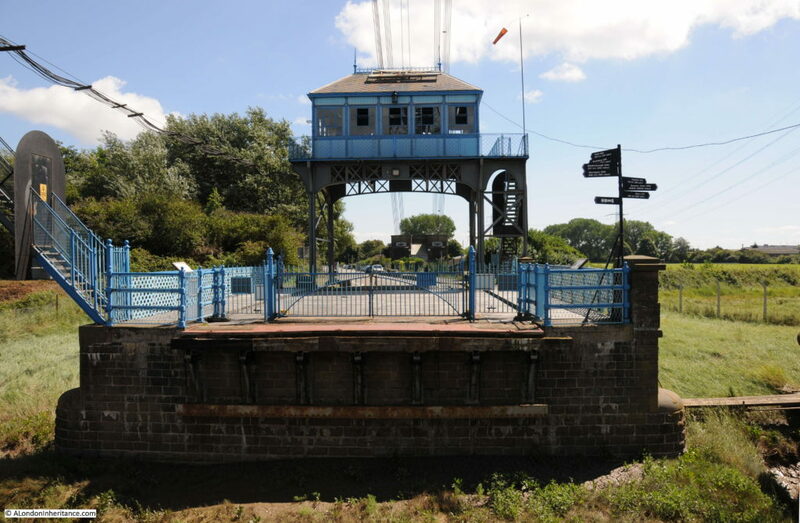 Amodin, along with Robert Haynes, the Borough Engineer of Newport were appointed as the joint engineers for the new bridge in 1901. It was Robert Haynes who had spotted the designs that Amodin had worked on for transporter bridges and encouraged the council to support this form of river crossing as the only realistic method. The contract to build the bridge was awarded to Alfred Thorne of Westminster (just managed to maintain a London connection in this post !) 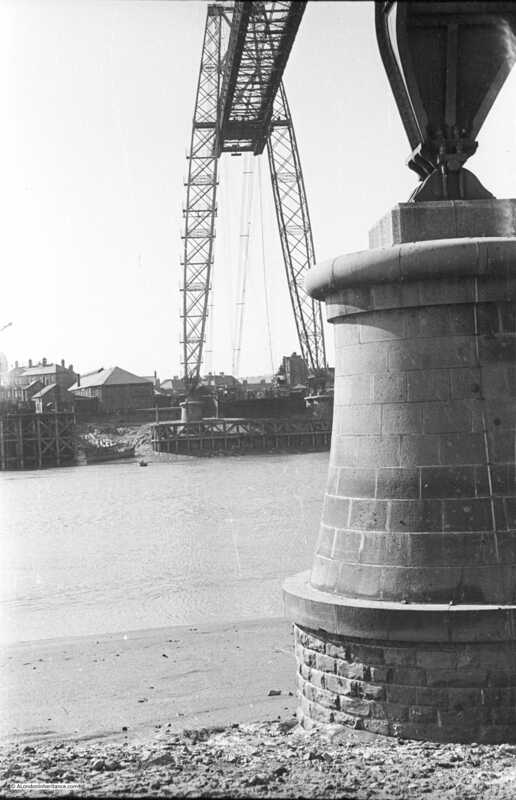 with work commencing in 1902 and the bridge opening in 1906. 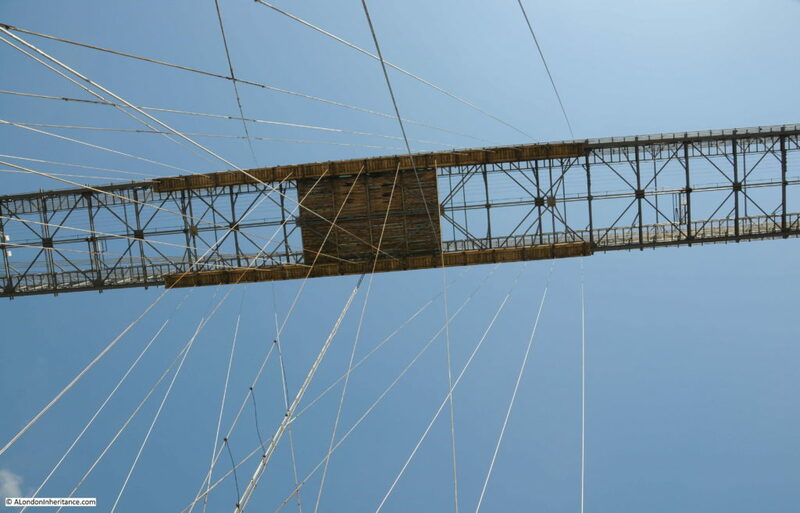 The design of a transporter bridge consists of a large structure across the river at a height to provide sufficient clearance above the high tide state of the river. A tower is located on each bank with a high level span between them. This carries a walkway and also a “traveller” from which is suspended the gondola. The traveller is pulled along the high level span by a cable connected to a motor near ground level. As the gondola is suspended from the traveller, as the travaller is pulled back and forth along the high level span, so the gondola carrying people and vehicles also crosses the river. A simple design, but one needing a complex bit of engineering to implement. 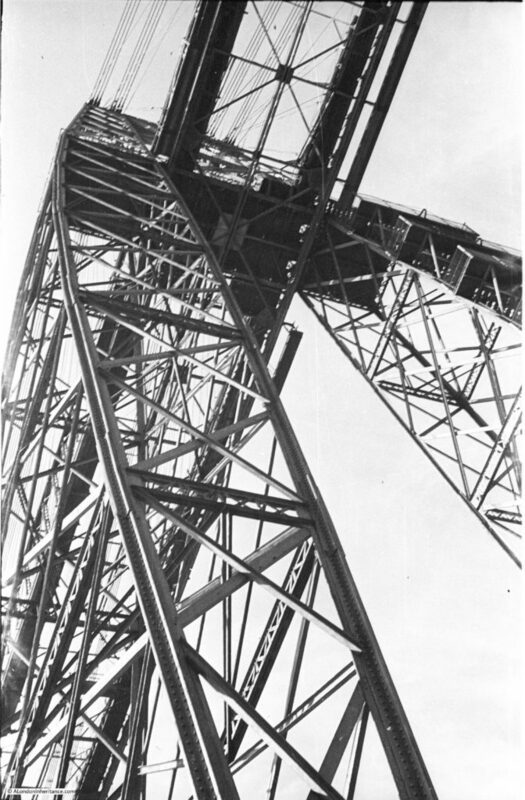 1947 view looking up one of the towers. 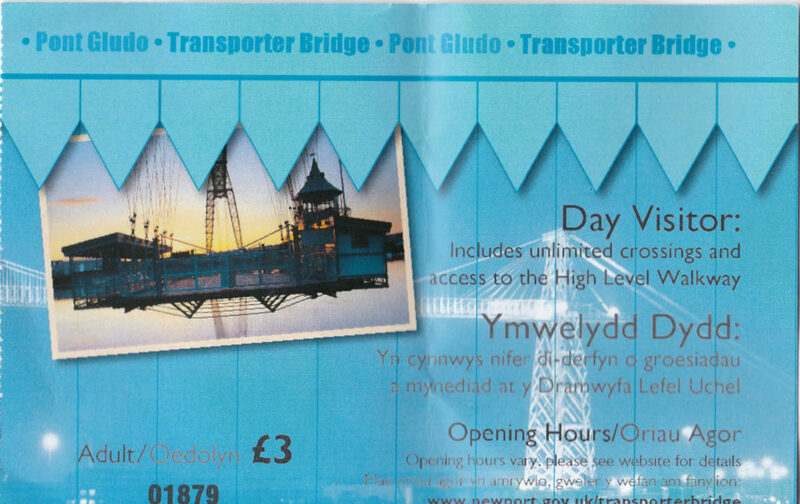 Thanks to Newport City Council and the Friends of Newport Transporter Bridge, the bridge is open and working from Wednesday to Sunday during the spring and summer period and a £3 ticket provides unlimited crossings on the gondola plus access to the high level walkway – incredibly good value (and you get a really good ticket). The height from the water level at high tide to the bottom of the span crossing the river is 54m and the top of the towers are 74m above road level. My father climbed the bridge in 1947 and took the high level walkway across the river. 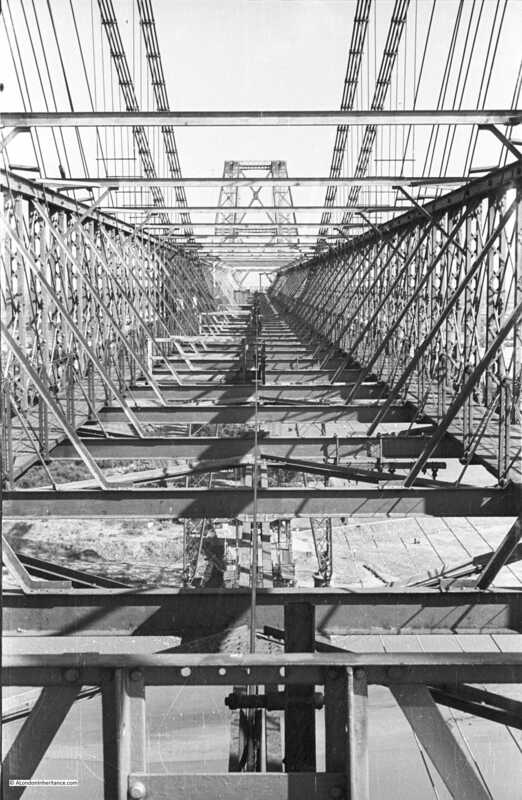 This photo shows the western end of the bridge with the anchor cables running down to their anchorage points. I have to admit that I attempted the climb, but it was a very hot day, I made the mistake of carrying my camera bag and iPad with my father’s photos on and we had already been for a walk so I only made it just over half way up before the direct sun started to take its toll. The following photo shows the cables running down to the anchorage points today. Looking along the high level span across the river. 1947 view of the gondola crossing the River Usk. And a similar view today. The blue building in between the two legs of the opposite tower is the motor house. From here, cables run up to the top of the bridge and attach to the traveller. 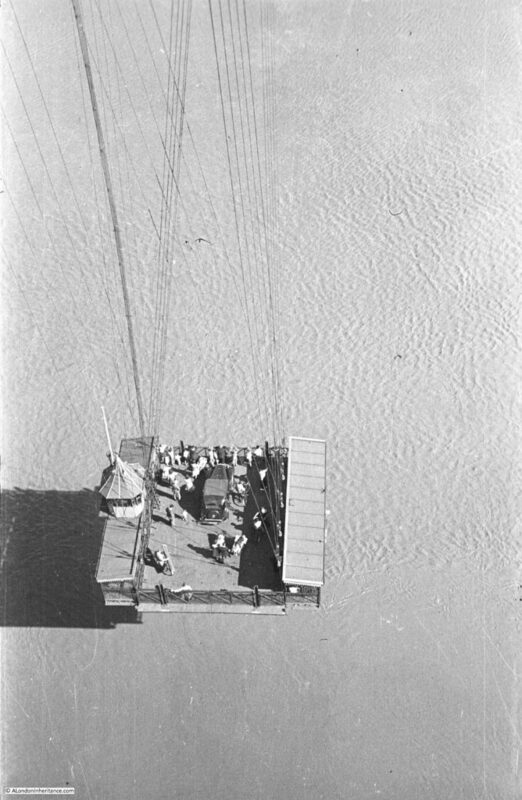 Another 1947 view of the gondola as it crosses the river. There is only one other transporter bridge in operation in Great Britain. A transporter bridge which opened in 1911 to roughly the same design still runs across the River Tees in Middlesborough. 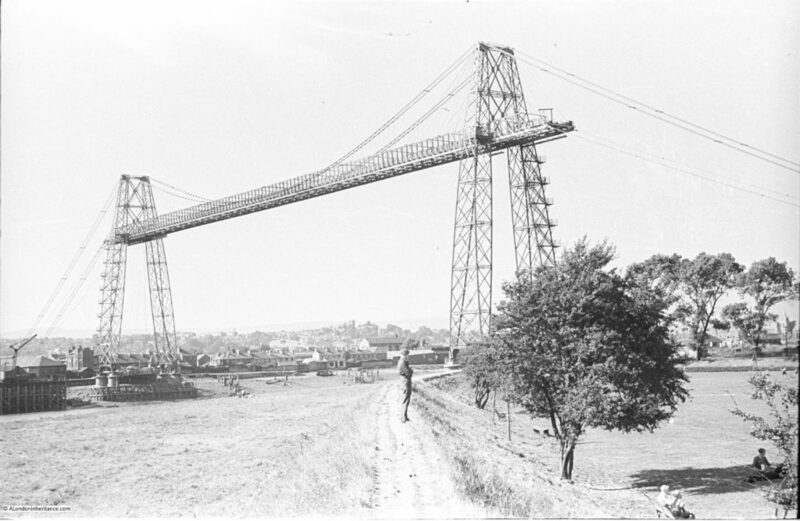 The original transporter bridge near Bilbao designed by Ferdinand Amodin is still in operation along with a single bridge in France and two bridges in Germany. Looking from the top of the east tower across to the city of Newport. Looking out from within the steelwork. 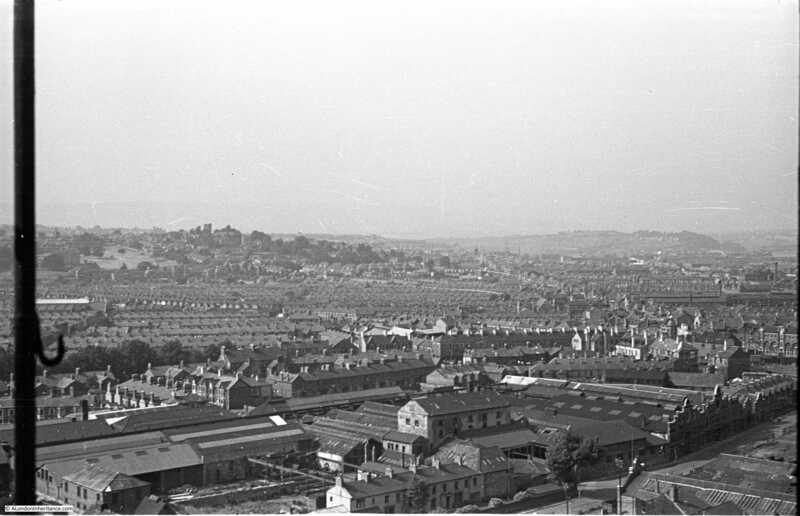 A series of views from the west tower looking over the city of Newport as it was in 1947. My view across the city of Newport today. I could not get an identical view to the above photos as standing on the stairway up the tower with a camera, bag and trying to see an iPad screen in direct sunlight was not that easy – I should have printed the photos. 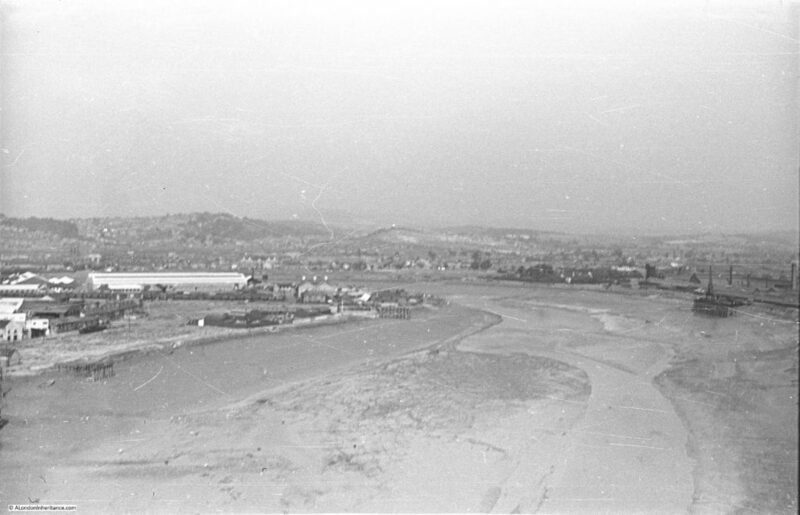 1947 photo from midway along the top of the bridge looking north with the River Usk at low tide. 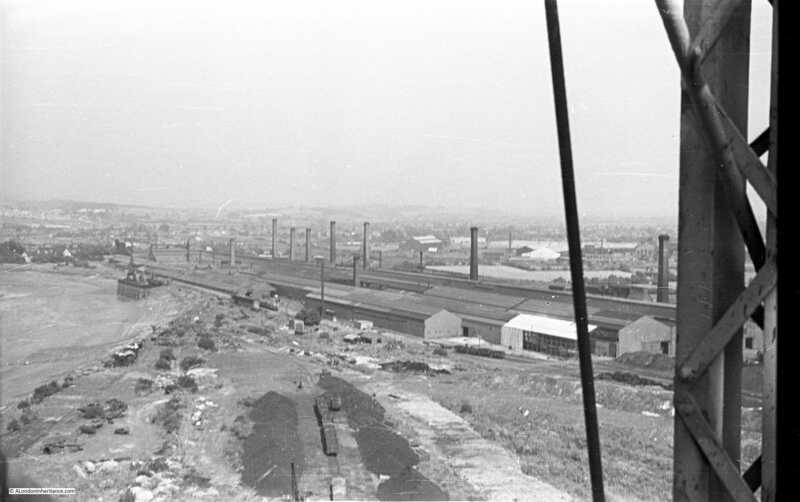 The edge of the steelworks is on the eastern bank of the river. 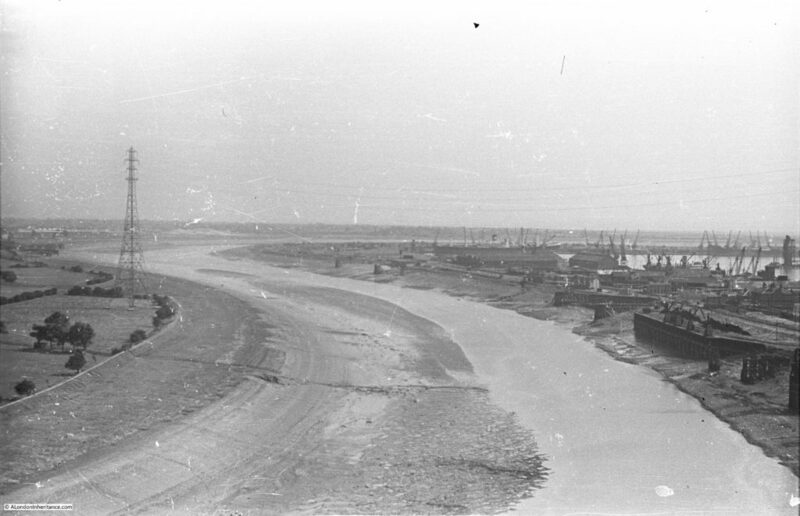 This was the main justification for building the bridge and can be seen on the right. The view today. 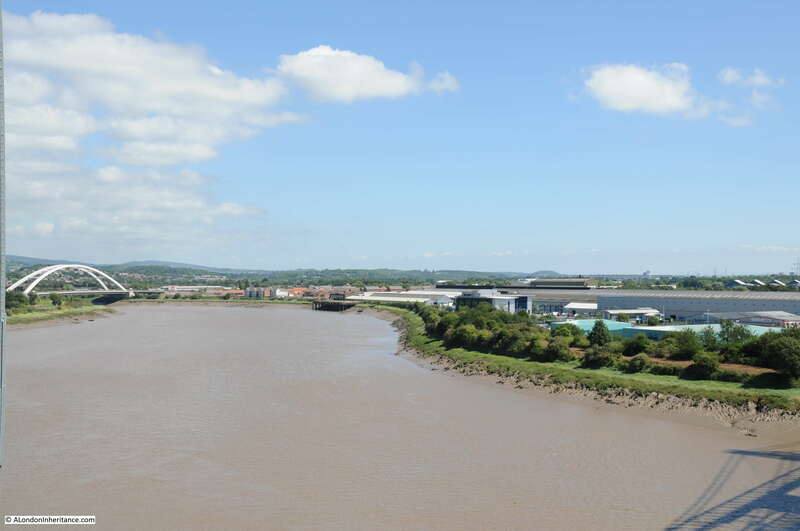 The new bridge across the River Usk can be seen in the distance. 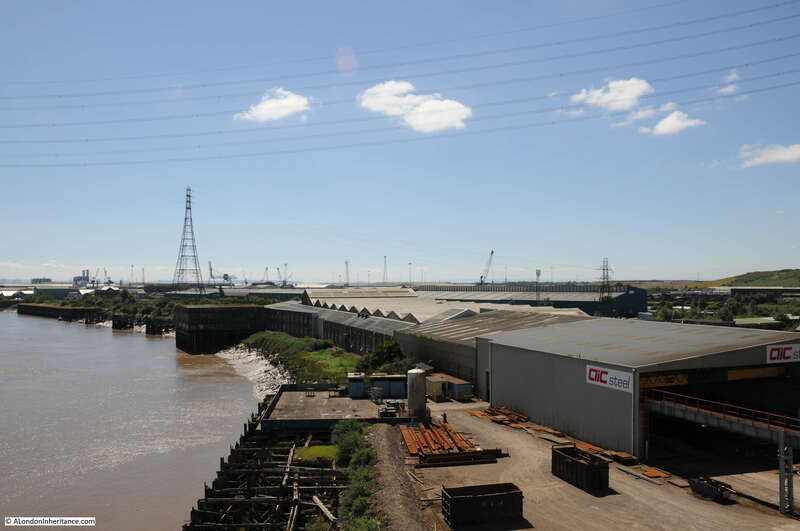 This, along with the change in industry on the east bank of the river meant that the transporter bridge was no longer the main route across the river, however it is now grade 1 listed and maintained by Newport City Council so hopefully its future is assured. 1947 view of the east bank of the river. The buildings are part of the Orb Steelworks, opened in 1899 by Wolverhampton based John Lysaght Ltd. 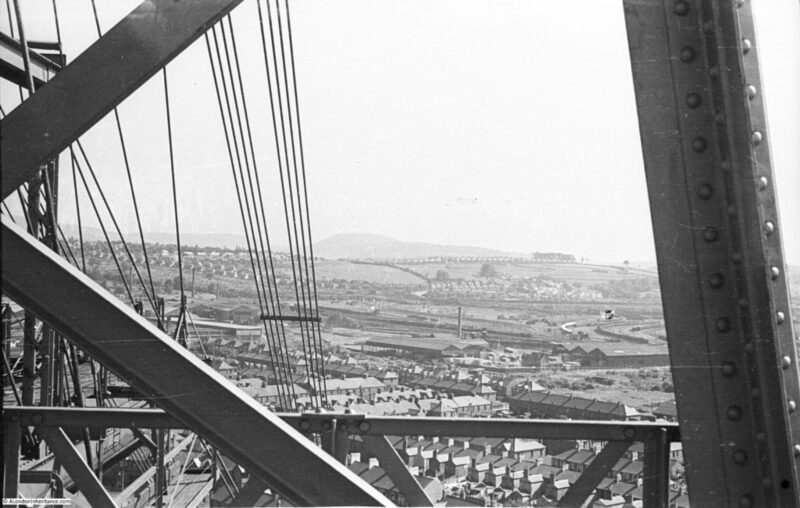 Prior to the opening of the transporter bridge, workers from the west side of the Usk had a four mile walk to reach the steelworks. 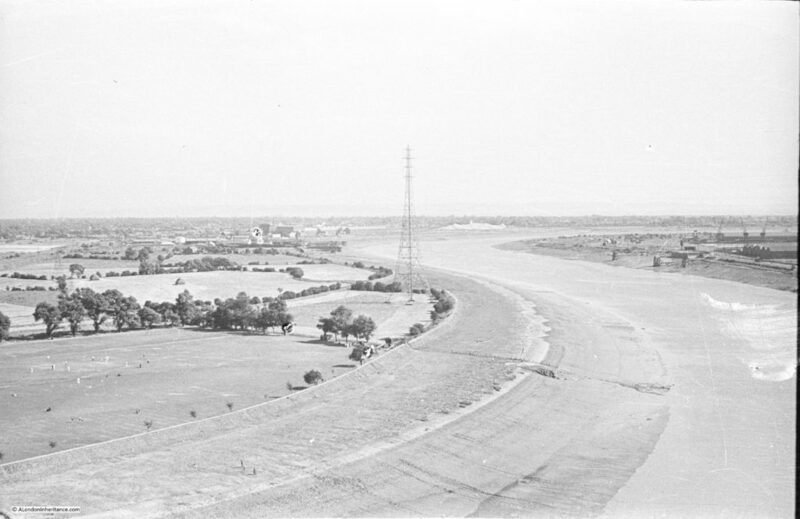 View from the transporter bridge walkway looking south, with the south east bank of the river on the left of the photo. It was on the river wall in the photo that the first photo of the transporter bridge at the top of this post was taken. I assume that the photo was taken at the weekend as there is a cricket match being played in the field. Looking a bit further to the right with the docks starting to come into view. 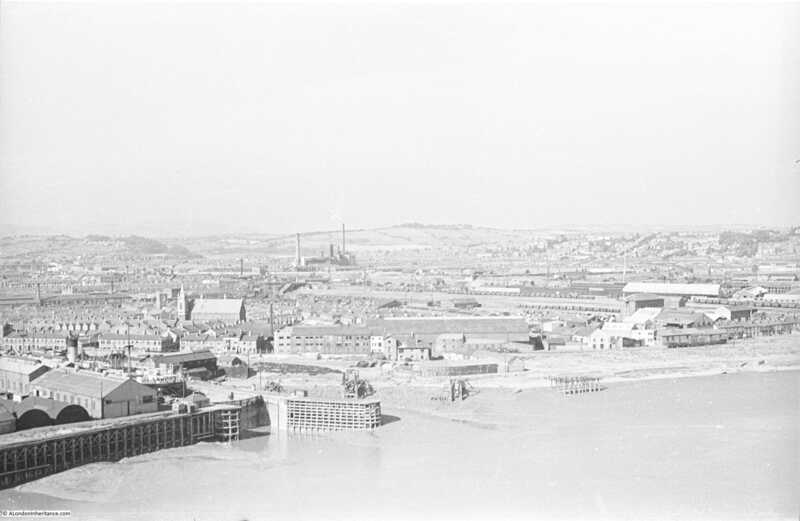 The same view today from half way up the west tower. The far electrical pylon on the left in the photo below looks to be the same as in the above photo. 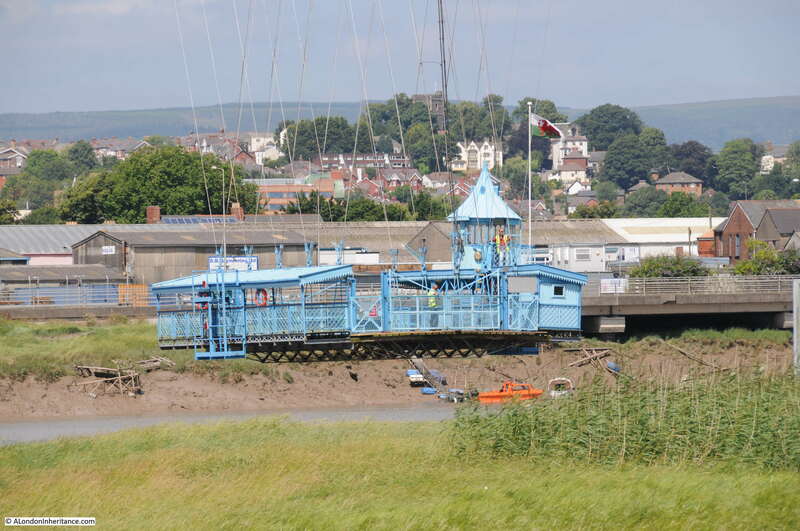 These two photos also highlight the tidal range of the River Usk. 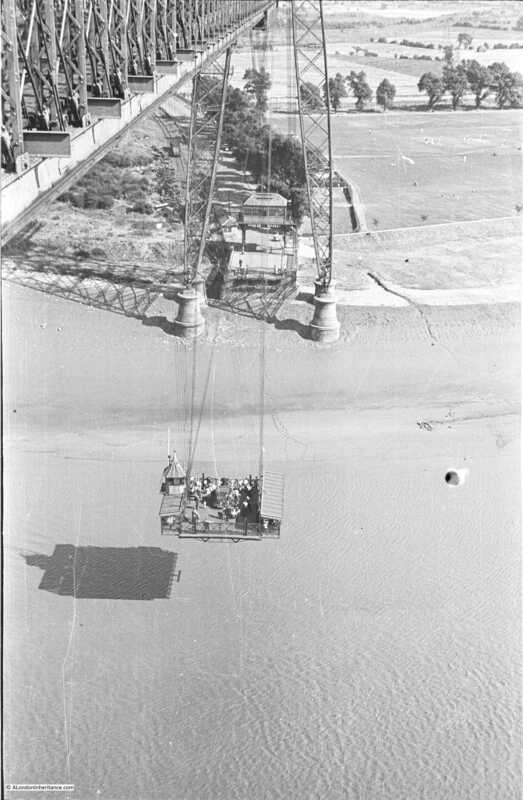 The above photo looks to be low tide and the photo below is getting on for high tide and this rise in the water level had to be accommodated in the height of the transporter bridge so that shipping could still pass underneath at high tide. Further to the right with a view of the docks. The end of the docks. the city of Newport is to the right. As my father took photos when it was low tide, he was able to photo the top of the foundations supporting the towers. The state of the ground on the riverbank required significant foundations and for each leg of the towers, the foundation was 6m in diameter with a depth on the east bank of 26m and 24m on the west bank. 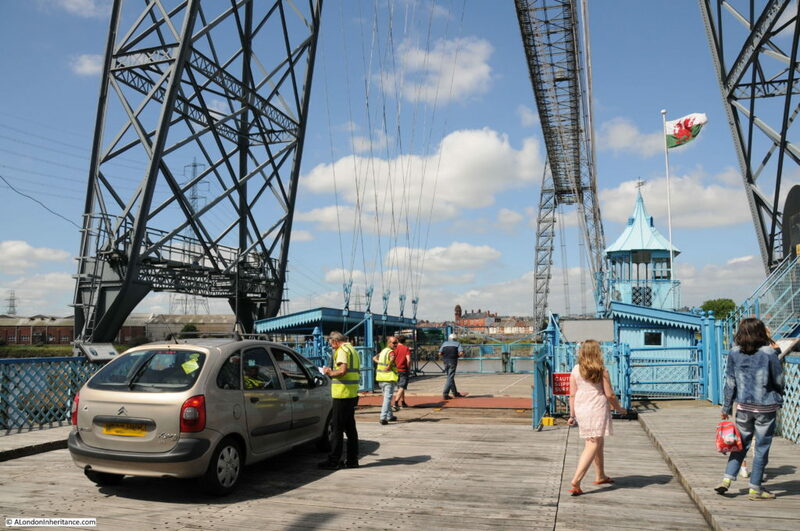 The scale of the transporter bridge is very impressive and is difficult to appreciate in photographs. The following photo is looking up the stairway of the west pier. It is these steps that provide access to the high level walkway. Boarding the gondola. This has space for four cars and covered seating on either side for foot passengers. Leaving the east bank of the river. The ride across is remarkably smooth. A slight bump as the gondola arrives at the landing point, however the trip across is fast and smooth. The operating position on the gondola. Looking up from the gondola to the traveller. The steel cables running up from the gondola attach to the traveller and as the traveller is pulled along, the gondola smoothly follows. The gondola halfway across the river. 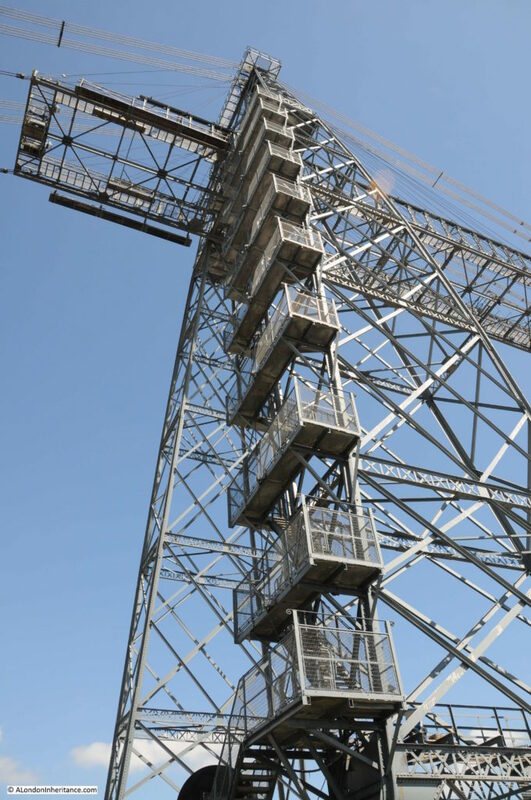 It is really good to see the Newport Transporter Bridge still in full operation and I can only hope that Newport City Council continue to have the funds to support this wonderful example of early 20th century engineering. 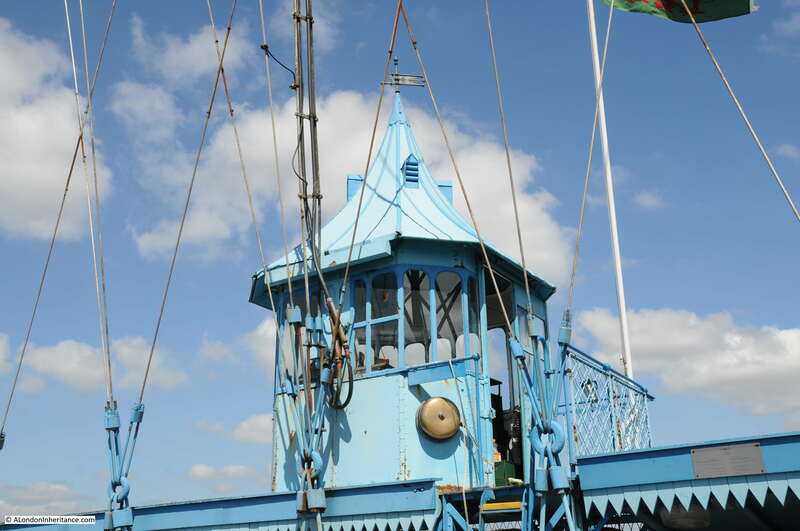 The link to the Newport City Council page on the transporter bridge is here, and the Friends of the Newport Transporter Bridge can be found here. If you happen to be in South Wales, stop off at Newport and see one of the last examples of this method of crossing a river in action. 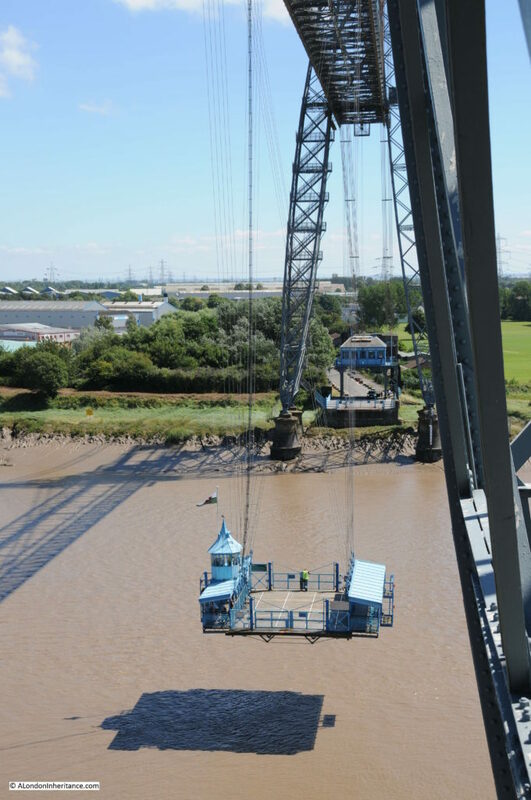 This entry was posted in Cycling Around Britain and tagged Newport, Newport Transporter Bridge, River Usk on August 14, 2016 by admin. Fascinating, Was there no limit to late 19th century ingenuity. I must try and visit that bridge but I wonder what the ride is like in a high wind? Yes – I too find this fascinating. Quite a remove from the Wren churches of London that first drew me into this site, but still enthralling! 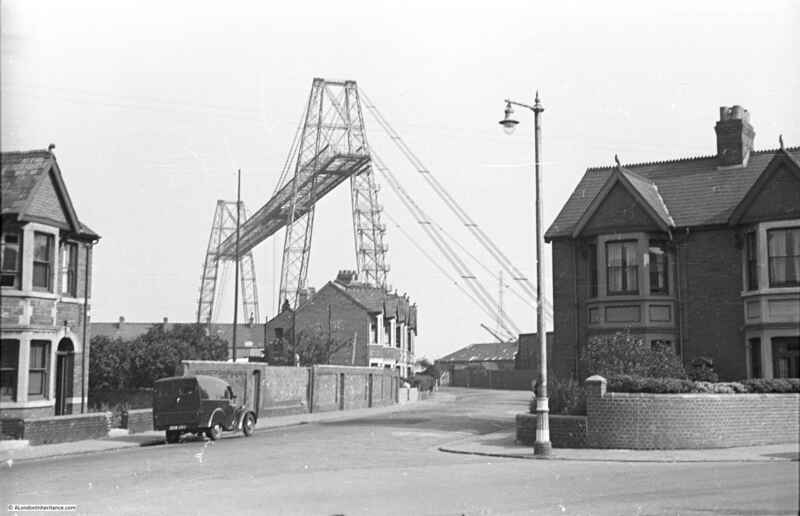 There was a third transporter bridge in GB, between Widness and Runcorn. I think it was the biggest in the world. Replaced by a permanent traditional structure in the early 1960s. 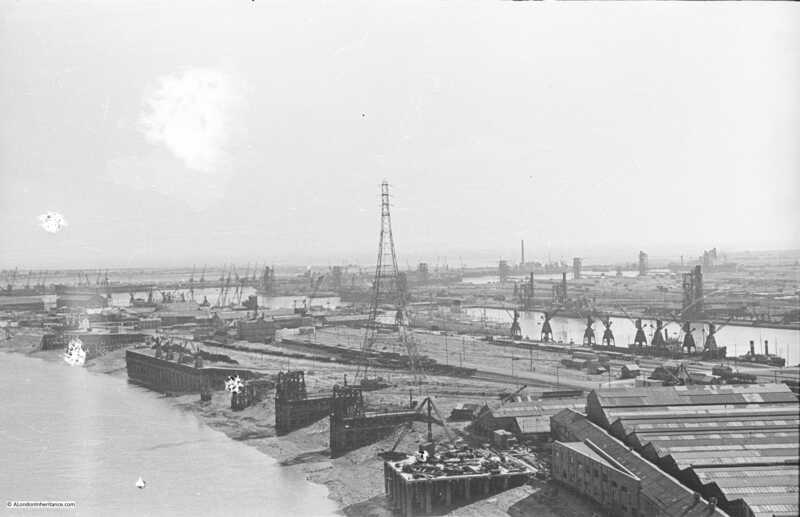 The orgianal loading ramps and ancillary building on the north side of the Mersey are still there. This brought back some memories from when I was in Middlesbrough as a student on a fieldwork excursion. 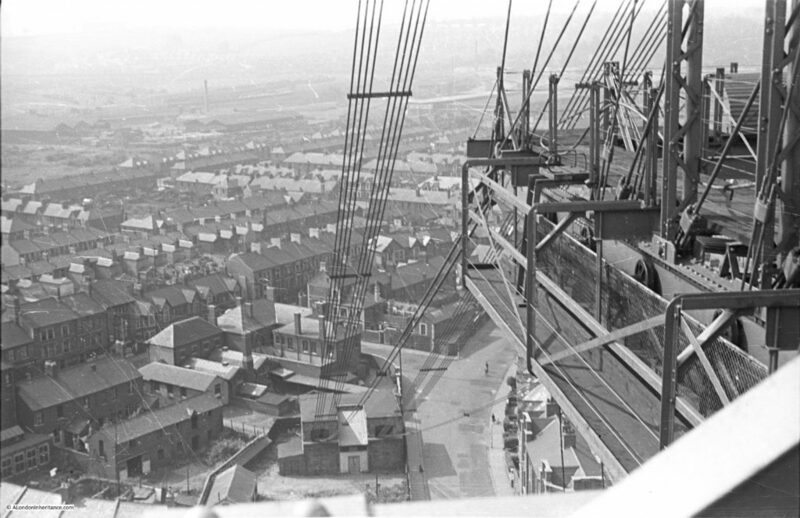 A group of us decided to climb the transporter bridge there up to the upper deck. Memorable – I was scared stiff! We were from London and that bridge was a real eye-opener. In fact the whole of Middlesbrough was something of an eye-opener for us with terraced houses near to the shipyards, blast furnaces and chemical works. It was like hell on earth compared to London! And the bridge just seemed to be a part of that industrial mess. But I’ve been back since and we can now see that structures like these are important pieces of our industrial heritage and are worthy of cherishing. 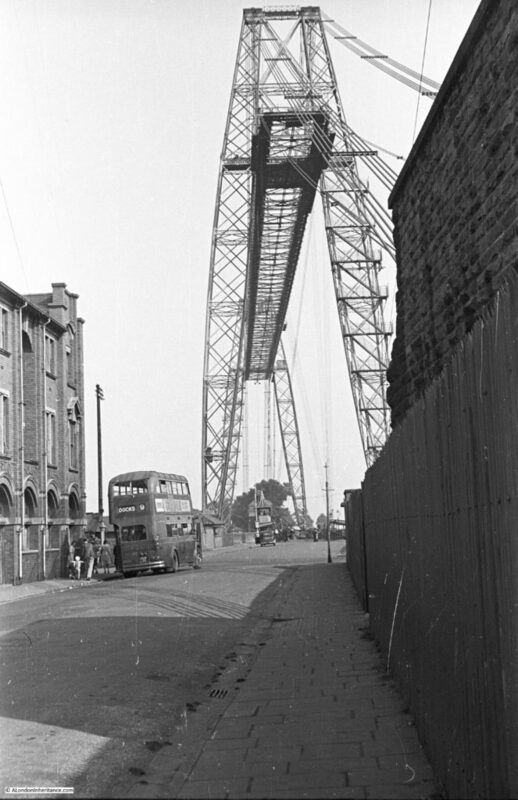 Unfortunately we have lost a few transporter bridges and the one at Warrington is sadly at great risk of being lost. It may not be London but it’s still a delight to read! Another excellent article. As a native north-easterner, I immediately assumed ‘Newport’ and ‘Transporter Bridge’ to relate to Middlesbrough (no extra ‘o’ In ‘brough’) which has a Newport Bridge (a big and intriguing lift bridge) and a Transporter Bridge, which is the largest in the country. There’s an excellent £5 guided tour up and over the top of the latter (up and down by lift) and a small and fascinating museum below. The bridge makes a nominal income from cross-river traffic – and probably a lot more from chemical and industrial pipes carrying materials across from either bank. Very much worth a visit!